A cat-and-mouse suspense thriller featuring a retired homicide detective who's haunted by the few cases he left open, and by one in particular - the pre-dawn slaughter of eight people among hundreds gathered in line for the opening of a jobs fair when the economy was guttering out. Without warning, a lone driver ploughed through the crowd in a stolen Mercedes. The plot is kicked into gear when Bill Hodges receives a letter in the mail, from a man claiming to be the perpetrator. He taunts Hodges with the notion that he will strike again. Brady Hartsfield lives with his alcoholic mother in the house where he was born. And he's preparing to kill again. Only Hodges, with a couple of misfit friends, can apprehend the killer in this high-stakes race against time. Because Brady's next mission, if it succeeds, will kill or maim hundreds, even thousands. In the early days of the Great Recession, hundreds of unemployed people are camping out outside the building where a job fair will take place the next day. They're not sure whether the "guaranteed 400 jobs" really will materialise, but they're desperate to be the first ones in and have a good shot at one of them. And then, at dawn, a big Mercedes comes off the road and starts driving right at them. It doesn't slow down; in fact, it accelerates. All hemmed in, people can't get out of the way fast enough and many get run over. Eight people die and many more are gravely injured. The killer gets away. A year later, Bill Hodges receives a surprising letter. Hodges is a recently retired detective and one of his last cases was that of the Mercedes killer. In the months since his retirement he has been feeling his life is pretty much over. He sits all day in front of the television, eating junk food and playing with his gun, thinking of all the retired policemen he knew who ended their lives by eating their guns soon after retirement. All that changes with the letter. 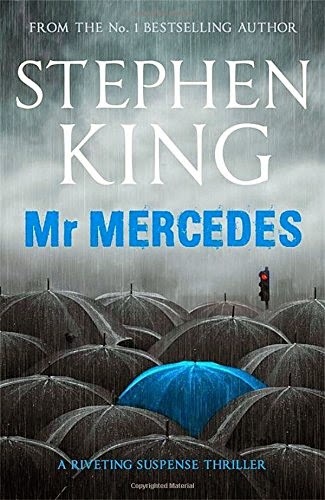 The author claims he's Mr. Mercedes and taunts Hodges. There is enough information there for Hodges to be certain that the writer is who he claims he is, but he also sees beyond that. The letter is "cleverly" trying to nudge him towards suicide. It has the opposite effect. Now Hodges has a mission, a reason to live, especially when he discovers he's not the first person connected to the case the killer has targetted for manipulation. King is a fantastic storyteller. The story is told in short, punchy chapters and it fairly flies. We flip back and forth from what Hodges and the unlikely group of people he takes into his confidence are doing to catch the killer and the actions of the killer himself. His name is Brady Hartsfield, and even though he calculatedly told Hodges in his letter that he doesn't have the urge to kill again, he's definitely planning to. He wants to go out with a bang. This is suspense with a real sense of danger and loads at stake. King is willing to put his characters through the wringer, and even good people are not safe from having really bad stuff happen to them. I tried to tell myself not to get too attached to characters, but King beat me, and I couldn't help but believe in them and care deeply about what happened to them. The sign of a good audiobook is when I end up actually talking out loud when something particularly bad or good happens, and that was the case here. "Oh, no, no, no, no, NO!!". I liked that none of these two antagonists are larger-than-life. Hodges is a good cop, but he's certainly fallible and not some perfect hero. Brady is a complete loser, pathetic rather than master criminal. This made the story completely unpredictable, and much more exciting to me. This is basically suspense, but you can see the horror writer shining through in some sections. There's one point in particular, when one of Brady's vindictive little plans goes horribly wrong, when it's chillingly clear that this is the same writer who created books like It and Pet Sematary. It gave me the shivers, as did Brady's very disfunctional relationship with his mother. The race against time to stop a killer plot is not new, but when done well, that doesn't matter. And I particularly liked the way King incorporated his setting to this timeless suspense plot. Most of the action takes place in 2010, in a medium-sized city in the Midwest of the US badly hit by the recession. While that doesn't play a huge part in the plot, beyond the shocking first scene, it creates a very vivid atmosphere. Great book. Oh, I might get this now! I haven't really loved his latest few books, although I haven't hated them. I end up being irritated by (what feels like) the unending nostalgia and privileging of the good ol' days. So I was thinking of putting this off. But I might pick this one up sooner than later now. I just finished it -- and I liked it much better than 11/22/63, too. I didn't hate Doctor Sleep but it wasn't even close to my favorite of his horror books (kind of a poor cousin to its predecessor) and this was a million times better than Under the Dome. Which makes me wonder if I should pick up Joyland now. I skipped it before, because I couldn't really see King + detective novels working well for me, but maybe it will. I honestly didn't know what to expect when I started it... didn't know what a Stephen King story should be, I guess. I read a few of his classics years ago, but then the only other was 11/22/63, and that had no horror in it. I've been looking at his other recent books and Joyland is the one I've settled on for my first. It sounds promising. Re: Rowling/Galbraith, I actually thought some of the Harry Potters were structured a bit like mysteries, so seeing how well she did in a more traditional mystery wasn't a surprise. I was much more doubtful about The Casual Vacancy, but I really loved it as well. However, though I'd say if you like Harry Potter you'll like the Robert Galbraith books, I wouldn't necessary recommend The Casual Vacancy. * settled on for my next, I mean!